Despite its incredible rise in popularity, there are still some industries that haven’t fully integrated social media into their marketing strategies. Because of consumers’ adoption of social for legal related information, law firms can no longer afford to remain on the fence. Why does this matter? Consider how people search for lawyers and legal help — many do so by using Google. Businesses who are active on social have a better chance of appearing higher in search results. If you’re not taking advantage of that relationship, you’re missing out on a major opportunity to acquire new clients. It’s been said that lawyers and law firms aren’t connecting or engaging with people in a meaningful way, and that most use social to drive search traffic. While this might be true for some, here are a few examples of how the legal industry is excelling on social media. While some law firms might not be quick to adopt social practices, and even fewer are eager to adopt changes made to those platforms. However, White & Case wasted little time transitioning to the new Twitter profiles. 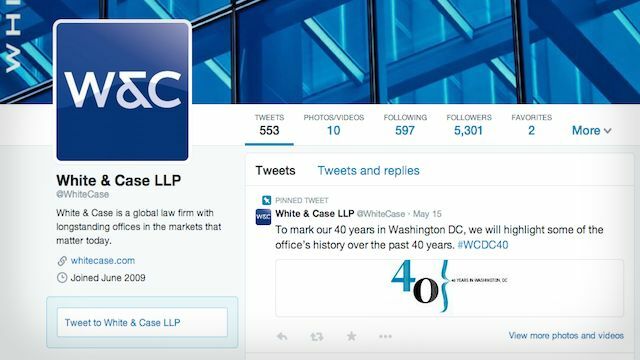 The global law firm successfully utilized the pinned tweet feature to promote #WCDC40. The hashtag highlights some of the office’s history over the past 40 years. Not only does this show a solid understanding of how different features can work together, but it’s also a great way to add a little humanity to a business. Instead of focusing on just legal matters or confusing follows with legal jargon, White & Case rather focus on introducing itself and its history to interested viewers. 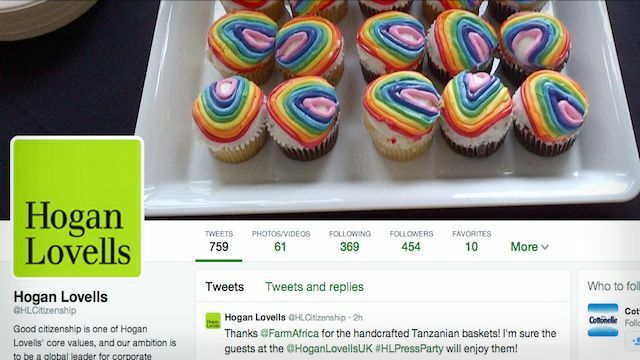 In addition to quickly rolling over to the new Twitter design, Hogan Lovells also keeps separate Twitter profiles for different aspects of its legal practice. For example, you can follow its international subsidiaries for more localized content, a press stream for major company news, as well as a more niche stream (@HLCitizenship), which focuses on the law firm’s citizenship initiatives. This is a great way to appeal to different audiences. 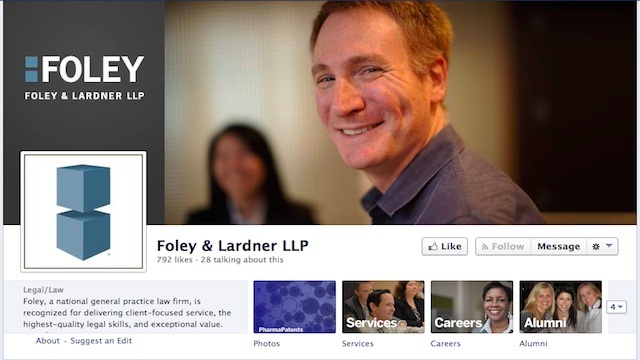 In addition to optimizing its Facebook Page for Graph Search, Foley & Lardner LLP creatively shares otherwise text-heavy status updates with rich, vibrant visuals. The law firm also provides fans with a solid mix of content — from industry news to company highlights. You’ll also notice that updates (whether text, photos, or articles) are shared consistently without major gaps in between. This shows visitors that the Page is active, encouraging them to engage. The American Bar Association’s Law Practice Management Section developed “Golden Gavels,” a type of law video awards that recognizes the best in class among small, midsize, and large law firms as well as law schools and legal industries. Since their development, more law firms have begun using video or exploring how to incorporate it into their marketing plans, according to Nicholas Gaffney, director of the Law Practice Management Law Video Awards. 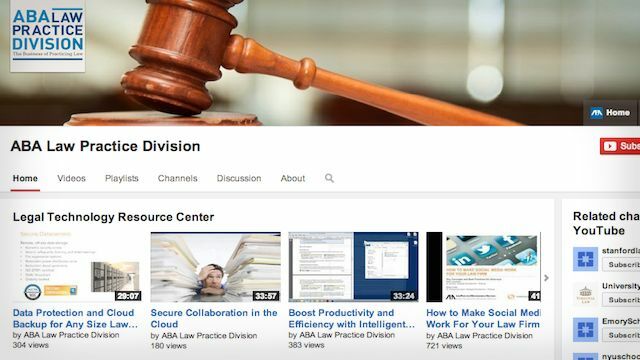 Many law schools, including Cornell and Boston University School of Law, take advantage of YouTube to share relevant, resourceful, and valuable information with students, guests, and visitors. As always, these are just a handful of the great examples of the legal industry using social media. For more information and ideas on how your law firm or practice can utilize social media on larger scale, check out our earlier article titled, Here’s How Law Firms Can Use Social Media to Drive Engagement.